We are not the army, but as a manufacturer we have to run on many similar parallels in order to get things done on time and done right. Willy Jane knows both of these drills in spades. As a 17-year veteran in the National Guard she has learned what it takes to find solutions to problems, gather resources, and then execute with an attitude of “never, ever give up”. Not to mention she’s a mom...is there any other more challenging boot camp than that at times? As the Supervisor of Welding at WSC and a manufacturing engineer, she not only welds our IDEAL STEEL stoves, she also tutors our welding team and designs jigs for more precise fabrication. On top of that she has contributed to product development and is always striving to achieve the best and most beautiful way to put two things together. When asked what she likes, her answer is an all-American, “Ice cream!”. When asked what she hates, the reply is ”BAD WELDS!”. We find that equally all-American. She’s a pro and a craftsman and it all goes into our stoves...which become your stoves. Take a look at some of the WONDERS of Willy Jane. She surely has “got it together” in more ways than one. Thanks, Willy! You are amazing! Born and raised in Vermont. She knows all about heating with wood! Loves snowboarding, riding her motorcycle and spending time with her family(not necessarily in that order). In 2005 she rode a Honda 250cc from VT to Sturgis South Dakota. She also flies (and has soloed) a Cessna 152. 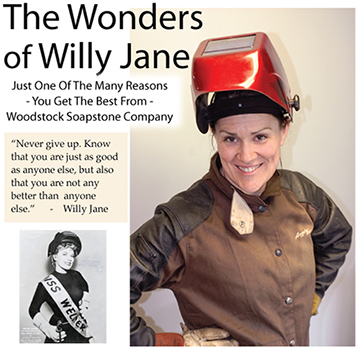 Click here to read about the History of Women as Welders and Workers in WWII.